Not to get you worried, but the folks in Texas dealing with the big flood didn't have much time to get out of the way. Home fires wake people up at 2 am as a siren blares. Tornados, hurricanes and earthquakes occur with regularity. Catastrophe strikes without warning, or without enough time to stop and gather. When the proverbial *hit hits the fan (SHTF) happens, Are you ready? My followers likely are a bit more aware but let's make sure, shall we? This incredibly common event, over 1,451,000 per year in the US causes the death of over 3000 people in a year. Are you ready if the Poop hits the fan? Since I'm fortunate to have several fire fighters in my family, I'm sharing their best advice for your safety. Are there tested, working fire alarms on all floors of your home? Have you had a fire drill from all rooms in the house? Have you escaped each room without using the door? Do you have an outside of your home meeting place picked out, and do ALL of your family members know how to get there from their typical daytime and nighttime places? Do you have a plan for pets? Even your children need to know how, and where to meet up. The places need to be accessible and convenient so no long walks to the spot. Once you exit a burning building, DO NOT go back inside for ANYTHING. Once a fire has reached a certain point, the likelihood that anyone without protective gear will be able to enter and still get out safely is minimal. For a nighttime meet up in a city or suburb, your nearest neighbor is the best spot. Pick one, make sure it is ok with them to be the gathering spot. Each person needs to go there, report the fire to emergency responders and then STAY THERE. Unless they are trained firefighters, they will be more a hindrance than a help. Rural folk: Do you have a fire suppression plan inside and outside your property? Many fire companies have a longer response time to rural fires. ASK your local department their average response time. You may want to invest in an indoor sprinkler system. If you have an additional buildings on your property, do they have an independent fire alarm? Meet up spots in rural situations might mean picking an outbuilding or hopping in a car to get to a phone unless you carry a cell at all times. Daytime is likely to be more flexible with parents at work and children at school, but you need a plan to contact everyone in the family. Each person in the home should have practiced leaving each room, once using the door, another time using the window or second exit. If your bedroom doesn't have a second exit, it isn't a legal bedroom. Seriously consider sleeping elsewhere. If you need a ladder to exit through the window, get one like this collapsible one, and leave it at the window. Each person should have a pair of hard soled, slip on or easily laced shoes at the edge of the bed. Frequently, not having footwear immediately accessible allows for injuries. Having a towel in the room, easily grabbable, will give some protection from smoke, acting as a filter for breathing. Each of our bedrooms has a hook on the door for a towel, right above the bug out bag on the floor. Remember, stay low and breathe through the towel to filter some of the smoke. When you leave a room, first feel the doorknob BEFORE you open the door. If it is hot, go out the other exit. DO NOT OPEN THE DOOR. If it is not hot, open the door, stay low and exit as quickly as possible, then close the door again. This might prevent damage to the rooms contents. Do not open windows to "clear the air". An open window provides more oxygen for the fire to use to expand. Get out of the house as quickly as possible, pounding on other occupied rooms doors to alert. Call 911 or your area's emergency number once out. Wait for the fire fighters to arrive while counting people who have exited the building. Have ready a count of who and what pets are still in the building and likely rooms to be searched. DO NOT ever call your pet your baby. Realize that firefighters are parents too. They will do everything in their ability to safe a human, including taking serious risks. Although your pet is vital to you, please make sure the firefighter understands it is a PET and not a BABY they are searching for in the dark, hot, smoky fire. The searches are different and far more complex for a mobile pet than a baby. I'm going to repeat that because my brother the fireman gets to deal with these folks. STAY OUT OF THE BUILDING! Without protective gear, you will be overcome by the smoke within minutes. Let the folks with the training and gear, get their job done as quickly as possible. 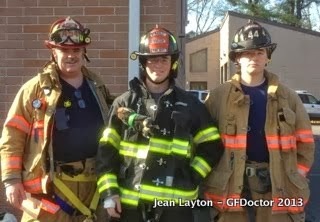 The best way to help a firefighter who is working is to stay out of thier way. They practice and train constantly to get in, rescue people and pets, get it knocked down and get out. Don't be an obstacle in their way. Once out of the building, hopefully you have a bug out bag in your car for your immediate needs. Don't have or don't know what a bug out bag is? Read this post.